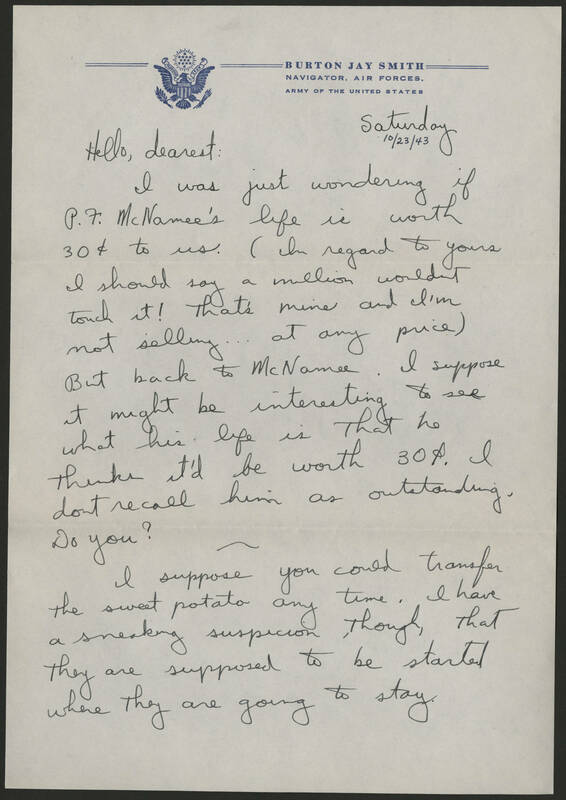 Saturday 10/23/43 Hello, dearest: I was just wondering if P. F. McNamee's life is worth 30¢ to us. (In regard to yours I should say a million wouldnt touch it! That's mine and I'm not selling... at any price) But back to McNamee. I suppose it might be interesting to see what his life is that he thinks it'd be worth 30¢. I dont recall him as outstanding, Do you? I suppose you could transfer the sweet potato any time. I have a sneaky suspicion, though, that they are supposed to be started where they are going to stay.